Dropped off a 4.0 block, 4.2 crank & rods at the machine shop this afternoon. Hope to get the port/polish done on the cylinder head soon too, then it's off to the shop for a little tweaking. I'm hoping for 265-275hp, 300ft torque. I'll post pics and specs as the work progresses. Thats going to be pretty sweet, you have a little... I mean a lot more grunt! is this for yours or daniel's jeep? This ones for Deb's XJ. Daniels heep gets a motor after this one is done. Probably a Buick 231 V6 if i can find a builder for a decent price...like free!! I'm thinkin' that you in a skirt hangin' out at the machine shop....the right fella might come along and build ya one. Stopped by the shop today. Block is boiled and looks purdy. It will get bored either late this week or early next week. Connecting rods are all cleaned getting new ARP rod bolts. Crank should be back from the grinder late PM today or tomorrow. I'm heading out to the garage to get busy on porting the head. Im not a jeep guy, but dont those numbers seem a bit high?? What are you running for induction?? Depends on what pkg he's going with or building for himself. Those numbers aren't unheard of. No not really, the stock motor generates 225 ft lb torque @ 3000 rpm. The motor will use a '99 intake with equal length runners, 21-24 lb injectors and the throttle body is going to get massaged as well. I haven't decided 100% on the cam yet, but I'm getting close. Block after the hot tank. After a little grinding this evening. I'm really looking forward to getting this beast on the engine stand and stuffing it full of new parts. JK, actually that's what any engine build is all about....the new parts. Who are you using for a machine shop? McCabe Motorsports. Robbie McCabe builds engine for all kinds of racers. Oval Track, Stock Cars, Hil Climb, Drags, etc. I should've taken a pic of the HUGE 565ci motor he just built. OMG! Sweet.. Motor looks good.. New motors rock.. I guess I should have started this thread with a disclaimer. Oh well, better late than never. I'm about as far from a stroker/motor expert as you can get. There probably won't be any profound revelations or flashes of brilliance anywhere in this thread. Everything you see and read hear can be found on the WWW with a little time behind the keyboard. Please don't mistake this thread as an attempt to impress anyone with my build-up. It's simply an attempt to share a project my family and I have been wanting to do for a long time. It's here for entertainment purposes only. If you learn something...IT'S NOT MY FAULT!! In order to gain a few more ponies and maybe a little torque as well I opted to port the heads. I could have had the work done for a few more bucks, but I figured WTH! I'll give it a shot. This first one is a close-up of the head before grinding. Take a look at the circular area, thats where the exhaust manifold mates to the head. Not a very good match. This one shows the head after opening up the intake and exhaust ports so they more closely match the intake and exhaust manifolds. This one is the '99 manifold after removing some material from the outlets. I'm not done with it yet. The aluminum comes off very fast so a soft touch is needed. 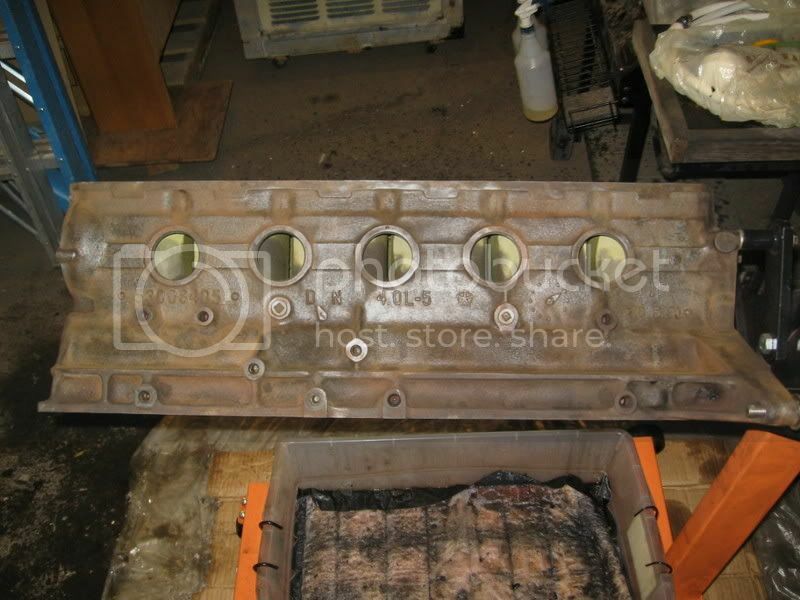 I dropped off the cylinder head yesterday at the shop to be tanked, decked, CC'd, and a 3 angle valve job. I talked to Robbie McCabe for a little while, he's expecting the remainder of the parts today or tomorrow and should have all of the machining done by the end of the week. WOOT!! The crank is back from the grinder, it needed .030" removed from the journals to clean them up. Turns out the front journal was not concentric with the rear journal. Not typical by any means, but not exactly surprising either. OEM components are never perfect. All comments, suggestions, or questions are welcome. Right on Frank Will she let you drive it after it's done? Great Choice I've had several done there over the years & sent others there as well..................Noone I know has been ever been disappointed in their work. Plus they actually take the time to talk to you about what you want out of your engine, & they don't want you to spend money you don't need to spend on it. McCabe is the only machine shop I'll ever use. Glad to hear you've had good luck with McCabe Motorsports. I was impressed with Robbie the first time I talked to him. I think I lucked out when I found his shop. are ya matching ports to intake/exhaust or unshrouding a little too? Yes to the first part of your question, and "I not sure what you mean" to the second part. I stopped by the machine shop again today (it's only a half block from one of my vendors). Robbi informed me that my compression was going to be a bit higher than I anticipated. I had originally planned on 9.5:1 but it seems that I'm going to be a closer to 9.9:1...maybe as high as 10.4:1. Gonna have to buy Premium Gas after the motor goes in. FWIW, I've re-calc'd the engine spec's using the spread sheet at MADXJ.COM, but I don't have any idea about how to do a screen capture, so I can't post it here. I wouldn't mind getting some opinions from those of you care to share your knowledge. Turns out the block and the head were both sagging in the middle, just a bit though. Decking the block and head solved that problem. Here's the block after decking. I gotta tell ya folks Robbie McCabe is a great guy to do business with. He's been very patient with me and has gone the extra mile to answer all of my questions. He doesn't talk down to me, nor does he try to impress me with his vast storehouse of knowledge...and he's got it. I really feel like I found a super shop to deal with and I'll be going back when we start building my son's motor. Frank, there is a black XJ with a 4.0 that has a header on it at A-1 if you're looking. i think it was a 94. the header looked brand new. Hmmmmm.....I've gotta go get a flex plate, sooooooooooooo.... I'll have to take a look. Talked to the shop today, seems the Crane valve springs that were ordered didn't come with retainers or locks, and the retainers and locks have been discontinued as well. WTF?!?! 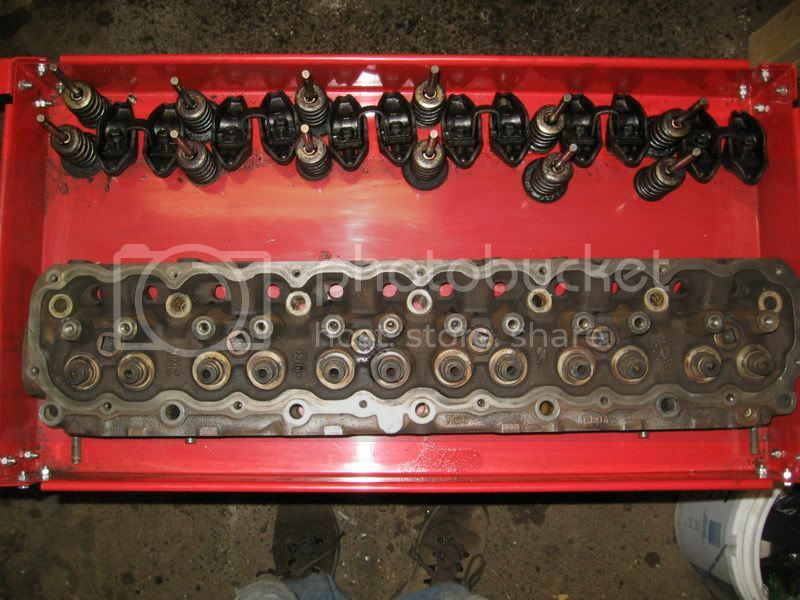 After talking it over with Robbie the new game plan is to spot-face the head to accept very common Chevy SB valve springs that are suited for the lift of the camshaft. I'll post up some dimensions and part numbers if anyone is interested. I'll get those spec's tomorrow. That is looking really well. It looks like its pretty close to being finished. McCabe Motorsports was the competitor of a shop I used to work for/with, Competition Engines, except they were WAAAYYYY behind schedule. The flex plate mounts to the crankshaft and in turn has the torque converter mounted to it. I need to get a spare to Robbie along with a harmonic balancer so he can balance everything. Scored nicely at the bone yard today. Harmonic dampener, flexplate and a set of Dana30 axle shafts with unit bearing hubs for a whopping $40. The flex plate and dampener are at the shop so everything can be balanced properly. The cylinder head is done. The chevy valve springs are in and Robbie was able to reuse the stock retainers and locks. Spring pressure is right at 110 lbs. The valves required a little machining on the face so the head was re-CC'd. 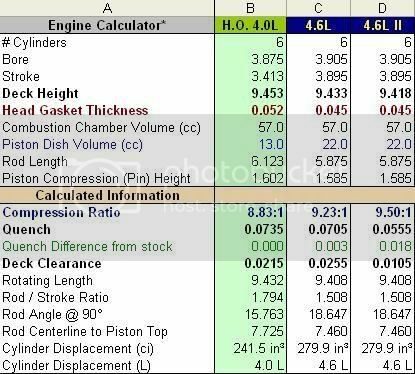 After going over the numbers Robbie suggested going to a different piston to get the compression down a bit closer to the 9.5:1 ratio I was shooting for. The original pistons I specified were H825CP-30, the new ones that we are looking at are a 677CP-30. The 677's have a different compression height but are still a Hypereutectic piston with a coated skirt. Last edited by Frank Z; December 3rd, 2006 at 09:05 AM. Sounds cool. Robbie put together my 4.1L Buick I had in my last buggy. It worked great until I repeated ran it with no oil pressure. Actually, it still runs great, it just needs heavier oil. The guy knows his trade, no argument. I'm really getting excited about getting this motor put together and installed. Although I'd love to dyno the motor but that's not an option at this point. I simply don't have the time to build the motor, remove all of the parts from the heep and install on the new motor and them deliver it to the shop....sigh. I'm gonna have to wait until I've got about 1k miles on it before putting it on a chassis dyno. I realize that I'll be getting results "at the wheels" instead of at the flywheel, but I'm sure there's a way to calculate the engine torque and horsepower based on the chassis dyno results. Gotta get my Google on. As I'm typing this my wife is reading along (Spell Checker!!) I just informed her that she's not to exceed 55mph for the first 500 miles. Her response was "55!!! ....thats just Wrong!" Thanks for contacting me on NAXJA. So is Robbie builting it for you, or just doing the machine work. If youre going to be building it Id like to stop by some time to get the feel of building a motor. As Im sure you found out Im working on a 4.6L stroker, that Im going to badge as a 4.7L. Ive spent about a year researching how and whats needed to stroke a 4.0. 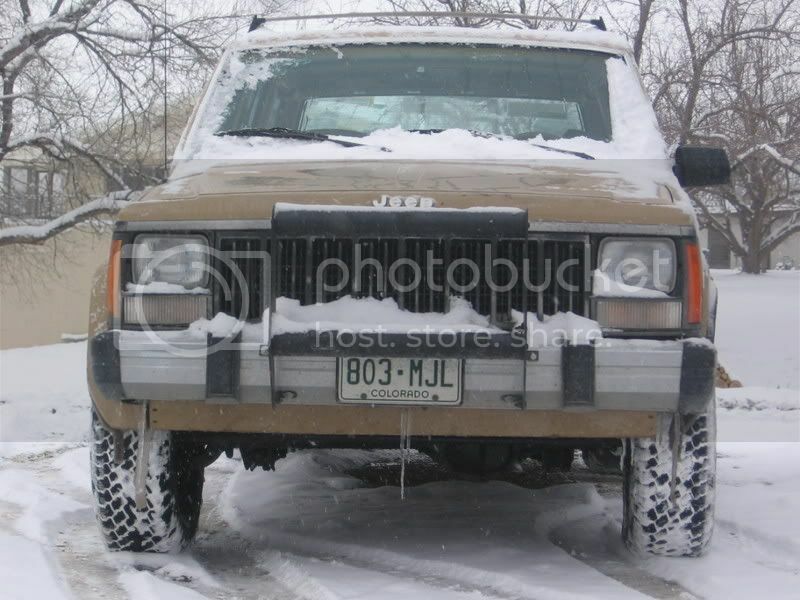 I had it planned since sugust 2005 when I bought my XJ. I already have the motor torn apart minus the valve stem seals are still installed. And I have yet to call machine shops for quotes. By the way could you post or send me a PM of all the prices you got charged like bore, hone, tankes, acid dip, etc? Here's my specs if your interested should be very similar to yours. Ill be using colum C. I know the compression is lower, but I dotn think there will be much of a noticable difference. Also I wanted to keep the quench as close as possible to stock. That engine looks sweet. I had put my on hold but this makes me want to start gathering parts again.. I'll let ya know the prices after I get my block and parts from the shop. Hopefully the change in pistons will get the compression down a little bit closer to 9.5:1. Don't count on the pistons matching the specs you find on the WWW, even if they are from the manufactures web site. I expected the H825 pistons to have a 22cc dish volume. The actual measurement was just over 15. The smaller volume made the compression ratio increase. Robbie is doing the machining, pressing the pistons and connecting rods, installing the freeze plugs and installing the cam bearings. My family and I are going to do the actual assembly work. Break out that easter basket and skip on down to the pull and save! I dont expect the dish to be 22cc either. Summit told me they have no clue but are probally the stock 13 or 15cc. So Im hopping I can just get the piston dish volume increased at the maching shop. It's a bit frustrating. I wasn't planning on spending more for machining the pistons. It would have been nice to know the real volume, or at least something closer to the true volume. Something like "18 +/- 2cc's" in the spec's. Oh well, I'll get over it. Do I get to keep the bag and the rag? The block degreased. and blasted with the wire brinder. The head and valves, springs, and arms. The valvetrain is actually clean now dipped it in a purple acid that I failed to read the gloves required warning and had my hands peeling for a week. The beast that the stroker will be going into. Nothing wrong with the 4.0L in it right now, just wanted to rebuild a engine to do something I like and try and get my dad to enjoy doing something I like to do. Turns out it just pissed him off so Im giving up on making him happy. Last edited by XJoshua; December 3rd, 2006 at 12:30 AM. Yeah, it's true. Since I'm using a 12 counter weight crankshaft with a long snout I knew I had two options. 1.) Have the shop keep the crank a little longer and machine 1 centimeter off the end and re-tap if needed. 2.) Buy a 1cm spacer from Hesco for $30 plus freight. So what's a stroker builder to do that's inexpensive and will still provide the proper harmonic balancer location? I had a balancer that came with the 4.2L crank. Cut the center section out. Use a properly sized precision broom handle to aide in cutting the rough spacer. Cut the rough spacer with surgical precision. I suggest limiting coffee intake before attempting this part of the operation. Mark the Spacer at just over 1 cm and use a drill press as a lathe. A fine tooth hack-saw was also used in this step. Cut the spacer to slightly more than 1 cm thick. Grind and sand the spacer to the desired 1 cm thickness. I'm hoping to pick everything up at the end of this week and start cleaning and assembling as well. With a little luck the motor will be ready to go in about a weeks time. I was hoping to get everything last week, but "Stuff Happens."